Berta berates Gisella Nadja for working too hard in her Betar Zionist group and advises her to think more about herself and her own future. She also warmly congratulates her older sister on her forthcoming 19th birthday. Berta then reports on all of the wonderful and versatile qualities possessed by their father&apos;s wife-to-be, Fritzi Fränkel, but Berta exclaims that Fritzi can never replace their mother. Hugo inserts positive information about Fritzi and some joking negative criticism of Berta into this letter. After a long time, I am dropping you a couple of lines again (because she has so much to do; editor’s note)2 and I want to catch up with everything that was neglected, or better said, I want to write down all that has been neglected. Thank you for your dear lines, which pleased me immensely, because you are finally leaving this Kibbutz and going to a different one. My only wish is that you can be a human being again; I mean that you will hopefully have some time and rest for yourself. That’s my heartfelt wish! That you can, will and should think of your future! It’s high time! 19 years old, no job, nothing in your hands, only this hakhshara3 and a nice defective heart valve! What are you doing anyway, in the new Kibbutz or where are you now? Write me all the exact details! Apropos 19 years: I congratulate you with all my heart on your birthday and I am sorry that I cannot congratulate you in person. I wish you luck, long and healthy life and that all your wishes come true. I hope that your 20th birthday will be celebrated within our family circle, thus between ourselves! You have certainly already heard from Dad, that he may be getting married again soon (he certainly will) so that we are going to have a second mother. But our Mommy is irreplaceable! I will report all the details to you. She is supposed to be a lady, but a very capable business woman and housewife.4 Putzi [Anna]5 is working for her parents and she is also one of my customers; that’s how Dad made her ac-quaintance. She is a very nice lady, very educated and musical, but above all, she has a good heart. She has her own apartment and can do everything: housekeeping, cooking, tidying up, laundry, ironing, mending, marvelous baking, in one word everything! A good catch! She loves Dad and is now living only for him. He stays with her all day long. Oh, one thing I forgot, she is also a widow and she has a perfumery with door-to-door delivery, that is run by Daddy. Because she does not have a maid now, she has to do all the house-keeping by herself. Also, from August first, he will already live with her! That’s all very well, but there is, of course, her family; needless to say our people already congratulate him - it is as follows: they are all for6 him! — what a fine daughter she is, isn’t she! !?? Such an idiot! Calm down, you know him; he is, unfortunately, already interfering in everything, and because almost every day, he visited her parents with her — for some time he did not, but now he started again — they already use “du” [ the familiar form of “you”] with each other in front of her parents.8 I hope it will turn out well. To be continued. I am well, I am healthy and so is Putzi, who is supposed to come over soon to wash her9 hair, because today is Sunday and she is free. 1. Berta is referencing Gisella Nadja’s membership in and active participation in the Betar Zionist youth movement. The main goals of Betar were to establish a Jewish homeland in British Mandate Palestine, and to teach self-defemse to the Jewish activists. 2. Berta and Gisella Nadja’s father, Hugo Jellinek, inserted these and other words into this letter in his Sütterlin hand-writing. 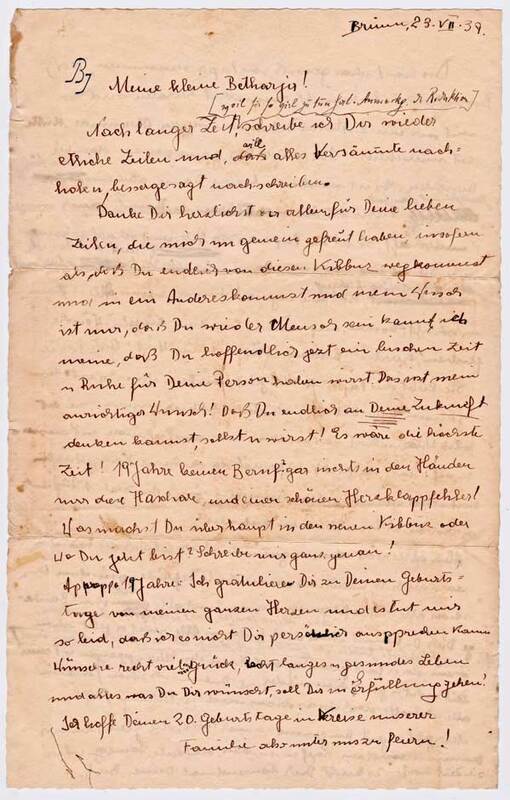 The reader can see the transcription of all of Hugo’s Sütterlin script, as well as Berta’s sometimes difficult-to-read handwriting, by clicking on the Transcription page. In order to differentiate Hugo's words from Berta's words, all of Hugo's words appear in this translation, in reddish brown and in italics. 4. These words were also inserted by Hugo Jellinek. Hugo crossed out and made illegible the words that Berta had written in this sentence, as well as in the second sentence following this one, about the musicality and good heart of the woman, Fritzi Fränkel, that Hugo intended to marry. 5. Putzi is one of the diminutive nicknames for Anna, the youngest of Hugo’s three daughters. 6. 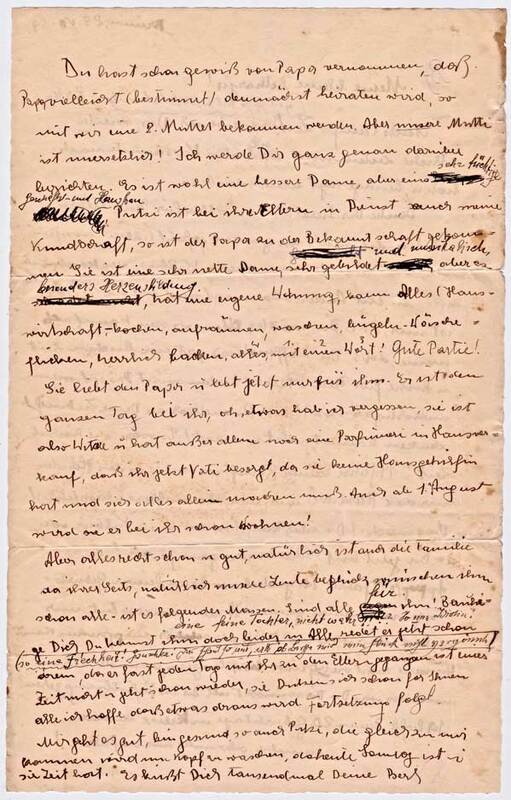 Hugo substituted “für” (English: “for,”) above the word “gegen” (English: “against,” that he crossed out here. 7. Hugo’s last insertions into this letter. 8. Berta was conveying to her sister that their father and his wife-to-be, had reached a level of closeness that made it acceptable, according to the then- current etiquette, to use the informal form of “you” when addressing each other in front of Fritzi’s parents. 9. In the German letter it's not quite clear, whose hair is to be washed, but probably, Berta was going to wash Putzi’s (Anna’s) hair, because Berta was then working professionally as a hair-dresser.